Galactic Command is a brand new progression system coming in STAR WARS™: The Old Republic’s™ newest expansion, Knights of the Eternal Throne. Premium players (subscribers) who have reached Level 70 can access Galactic Command from anywhere! This system puts everything in the universe at your fingertips, accessible through one interface. With every battle you face, including Warzones, Operations, new erupting action-packed Uprisings, you earn Command Rank, unlocking increasingly more powerful rewards and impacting the balance between light and dark side forces galaxy-wide. To access the Galactic Command interface, simply press CTRL+G by default, or you can click the Galactic Command icon which is located at the top of your screen. With the interface open, you will see that you are now able to queue for Daily/Heroic Missions, Story Chapters, Flashpoints, Uprisings, Operations, PvP Warzones, and Galactic Starfighter (Space PvP battles). Galactic Command offers three Difficulty modes, Story, Veteran and Master , in most of the combat missions. If your chosen mission offers the ability to choose your level of difficulty, you will see a toggle you can access to set your chosen Difficulty level. The exception is Operations which you can only play in story mode when accessed through the Galactic Command interface. However, you can still access them normally in Veteran and Master difficulty. Galactic Command offers access to all of your favorite activities along with a new Command Bonus every day, making it worthwhile to play something new each day! When an activity has a Command Bonus, you earn bonus Command Experience points each time you play. Be sure to check back each day to see which activity has a Command Bonus. Earning Command Rank is achieved by playing almost any activity in the game. Every time you play, you earn Command Experience points which increases your Command Rank, earning you rewards in the form of new Command Crates. The Command Experience Points you earn are based on a few factors: the difficulty of the activity (Story, Veteran, Master), how many players are required, and how long it takes to complete. For example, you will earn substantially more Command Experience Points for completing a Master Difficulty Operation than you will for completing a Heroic Mission. The goal is to reward the highest level of Command Experience points for Master Operations, Ranked Warzones, and Master Uprisings . At the launch of Knights of the Eternal Throne, each time you earn a new Command Rank, you will be given a Command Crate. Increasing your Command Rank and earning Command Crates will now be the primary method through which players with max level characters can continue to increase the level of their gear. As a result, you can now gear your character by playing virtually any activity in the game! Command Crates contain multiple items including Companion Gifts, cosmetic weapons and armor, mounts, pets, and the most powerful gear in the game. As your Command Rank increases, so does the level of gear you receive . As an example (numbers are just an example), if you get a Command Crate at Command Rank 50 it will contain more powerful gear then you would have received at Command Rank 1. Starting with Knights of the Eternal Throne, players will be able to choose whether they are fighting for the dark or light side of the Force™. Upon doing so, all actions, including killing elite enemies, completing Missions, and making story choices will contribute to the ongoing dark vs. light side war on each server . 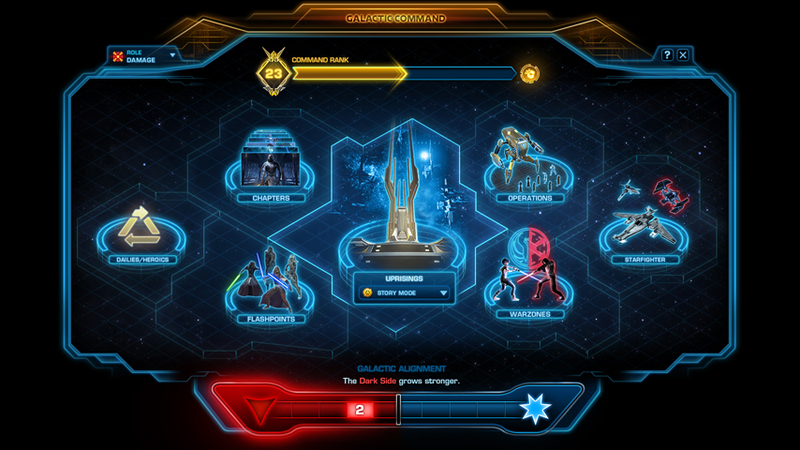 These Dark and Light side choices will influence the balance of the two sides of the Force on each server, reflected on the dark vs. light side meter shown at the bottom of the Galactic Command interface. As one side begins to dominate, players will begin to see the impact all around them. For example, if the dark side is growing stronger (i.e. reaching “Dark 4”), suddenly players may see Sith Acolytes begin spawning and attacking Alderaan and Tatooine! Keep your eyes open as your efforts change the galaxy around you. Your galaxy will remain in a “victory state” for a period of time before the war resets. However, this time, the losing side will have an advantage to try to swing the balance back in their favor. Galactic Command offers ongoing challenges and rewards every time you log in to play Star Wars: The Old Republic. Whether you are playing alone in your favorite gameplay mission to gain Command Rank, or joining with other players or Guilds to win the Dark vs Light side war, Galactic Command will keep you fighting for control of your galaxy !